Every month a member of the Carus team introduces his/her favorite work, whether it be a choral piece, a CD, a songbook or an instrumental work. The recommendation for April 2017 was contributed by Felix Sorg. 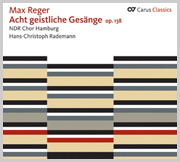 I first encountered Max Reger's "Acht geistliche Gesänge" op. 138 during my school music course. I associate many enriching choral experiences in the Trossingen Hochschulchor with these pieces. And I associate "Nachtlied" with a special appearance in the German Parliament: we traveled by train from Trossingen to Berlin to provide the music for an act of commemoration there on German national remembrance day. Our choir had to sit on the right and left behind the lectern in the seats for the ministers and permanent secretaries, and from there we followed the act of commemoration. The atmosphere in the assembly hall was quite special, although – and we learnt this from the unfavorable acoustic – it was more suited to parliamentary debates than to choral music. The simple, chordal-homophonic structure of the "Nachtlied" worked well in this, which is why the piece is often sung as an encore or where only a short rehearsal time is available. Anyone who is looking for virtuosity in the "Acht geistliche Gesänge" will not find it. The Geistliche Gesänge are eight chordal, homophonic relatively easy-to-sing choruses of short length, which owe something to the style of Bach's chorale settings. Reger chose this style of composition so as to give prominence to the textual message, which was not to be obscured by too great virtuosity. What is unique for me is Reger's interpretation of the texts, which he sets to music with delightful harmonies and attractive part-writing. For me the particular charm of these choruses lies in the combination of simple choral writing, charming harmonies, and profound textual message. Reger took the poems from the collection "Der Deutsche Psalter" by Will Vesper and set works by anonymous writers, Johannes Zwick ("Morgengesang"), Matthias Claudius ("Der Mensch lebt und bestehet nur eine kleine Zeit"), Petrus Herbert ("Nachtlied"), and Nikolaus Decius ("Das Agnus Dei"). In the "Acht geistliche Gesänge", for me the basic ideas of the human condition and Christian thought are concentrated: firstly, the fear and uncertainty about one's own finiteness and secondly, the hope and certainty of God's grace and protection. This is particularly brought to bear in the first chorus "Der Mensch lebt und bestehet nur eine kleine Zeit". 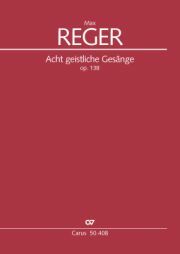 Reger composed the "Acht geistliche Gesänge", confronted with his own mortality, in the first month of the First World War, shortly before his death. As a moral counterbalance to the war, as it were, Reger explicitly stipulated that the choruses should only be published at the end of the war. But Reger did not live to see this. He died in 1916 in Leipzig. The first chorus "Der Mensch lebt und bestehet nur eine kleine Zeit" was found open on his desk after his death. 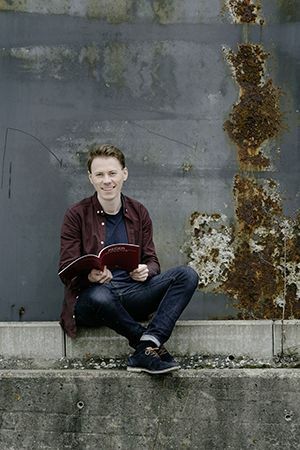 Felix Sorg is currently training as a teacher in music and German, and has been working as a student trainee in the New Media department since October 2016.